Orlando/Ocoee/Windermere Car Wash or Auto Detail? We’ve probably all gone to one before, the car wash. But what most people don’t realize is how much damage is really done to your precious automobile. Car washes even have it posted in several places on their property, “We are not responsible for any damage caused to your vehicle”. 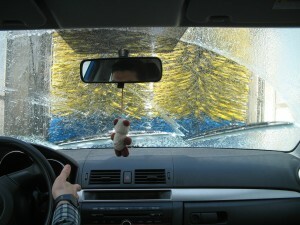 Though it may not seem like it, but an automatic car wash can be your vehicles worst nightmare! Fine scratches in your paint happen when dirt, from hundreds, if not thousands of dirty cars that came before yours, accumulate on the bristles then spin at high revolutions on your car paint. To finish it off, they use dirty towels to dry and ruin the finish. Along with incorrect drying methods, it’s like taking steel wool to your paint. As you leave the car wash, it is inevitable water flies out of areas not touched by a towel. These drops of water dry, leaving behind mineral deposits, that cause permanent damage when they etch into your paint. The same towel used to clean the wheels of the vehicle before your’s is now in the hands of the person drying the paint on your prized possession. Deep scratches are caused by solid particles left behind on the dirty bristles and towels. A stream of highly pressurized water filled with particles, aggressively streaming onto your car, will definitely cause fine scratches in the paint. What exactly is being sprayed on your vehicle at these car washes? Typically it is aggressive chemicals and soaps, they used to break down dirt so it is easier to wash off. Unfortunately, many of these chemicals stain rubber seals, damages trim, and strip the wax. The art of auto detailing requires a specific understanding of the unique needs of the vehicle, a lot of hard work, and skill. The professional auto detailers at Rite Now Mobile Detailing are highly trained in the meticulous process of restoring a vehicle, bringing back that new car sparkle, inside and out. Stop by one of Rite Now Mobile Detailing shops, in Ocoee at 2615 Maguire Rd. or in Windermere at 517 Main Street, at see the difference for yourself!